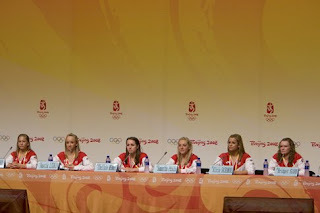 Jeff Cable's Blog: Olympics in Beijing - Opening Day! It is the day of Opening Ceremonies and everything is ready to go. I went into the Water Cube today for the first time and took some photos of the different swim teams and the diving teams practicing. The building is even more impressive in person than on TV. Other than the fact that it is humid inside (although still better than outside), the lighting is very good and the architecture is truly unique. Everything carries the water theme. If you look at the picture above, you will even notice that the seats are different colors representing the splashing of water. 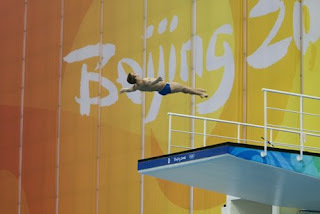 A diver practicing from the 30 meter height. That takes guts! 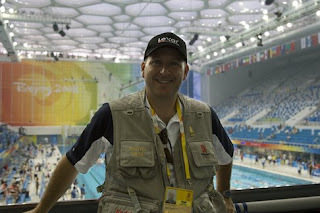 After the visit to the Water Cube, it was time to head back to the Main Press Center (MPC) to get organized for tonight. 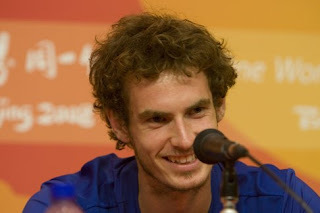 I also had a chance to join a couple of press interviews with the USA woman's gymnastic team (yes - my same friends from the flight over) and also with the Murray brothers (British tennis). Now it is time to get out of the MPC and get ready to capture images outside the Birds Nest. It turns out that, since there are so many VIP motorcades and foreign dignitaries, you have to have a special "up credential" in order to be on the grounds. I managed to get one of those this morning so I am good to go.